Artist Soma Surovi Jannat’s maiden solo art exhibition titled `Grey Contours’ will close tomorrow at La Galerie, Alliance Française de Dhaka. The exhibition is featuring more than 100 artworks including sketch, drawings and sound installation. In her artworks, the artist portrays the real world blended with her soaring imagination, which often seems to be an absurd and unfathomable realm, a reality beyond our rational understanding, and at times like a receding horizon. The recognizable forms of humans, animals and man-made objects are rendered unfamiliar since they are seen through the lens of imagination. In fact, in her artworks the objects of real world find a metaphorical expression, as such, "debased from their actual morphological structure." ‘Grey Contours’ consists mostly of a series of drawings interspersed with a few installations which embody Soma Surovi's experience of living in a Santhal village in West Bengal, India. Her sparse pen drawings rendered on handmade papers bring to light a new perspective of objects and natural elements. Besides, in the exhibition, a thirty-minute-long audio track of natural sounds, which the artist recorded from different places, also helps the audience to plunge in the silence of nature through her artworks. Surovi tries to incorporate her experiences of nature into the artistic space. Her efforts are directed towards harnessing the time and space which she herself has been a part of, and a matrix in which she has had the opportunity to develop her understanding of "being in the world". “After completing my M.F.A in 2016, I spent one more year in Santiniketan, plunging in the beautiful nature of Kopai and Khoai River, Saowtal Polli and nearby villages. Nature of the space that I experienced at that time comes surreally through my drawings and artworks”, said artist Soma Surovi Jannat about her maiden solo art exhibition. 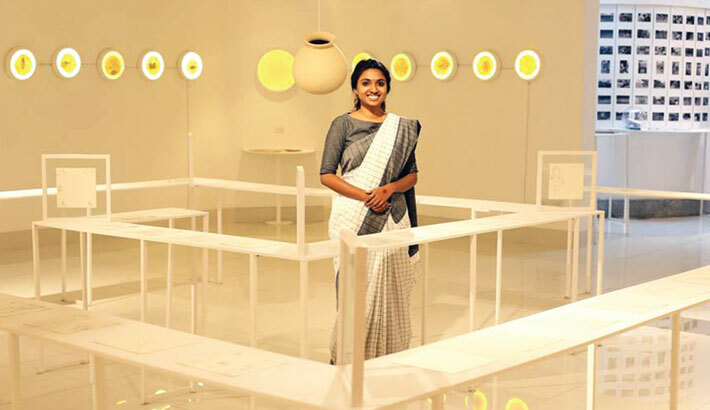 It is mentionable that Soma Surovi Jannat completed her B.F.A from the Department of Drawing and Painting, Faculty of Fine Arts, University of Dhaka, in 2013 and took her M.F.A degree from the Department of Painting, Visva Bharati University, Santiniketan, in 2016. She has already attended more than fifteen group exhibitions at home and abroad including 7th Beijing International Art Biennale, China in 2017 and 17th Asian Art Biennale Bangladesh in 2016. She received the Media Best Award in oil painting at the annual art exhibition of University of Dhaka, in 2011. The exhibition was inaugurated by the writer and art critic Prof. Dr. Syed Manzoorul Islam with artist Prof. Shishir Bhattacharjee and Mustafa Zaman in attendance on March 23, 2018.